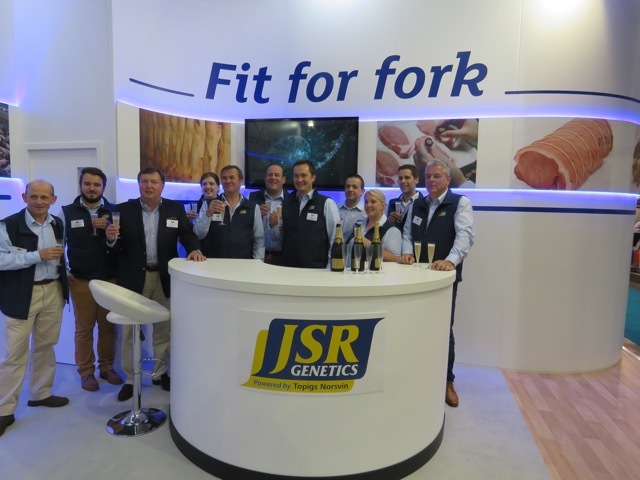 The JSR Genetics team were at the British Pig & Poultry Fair at Stoneleigh Park on 10 & 11 May, along with colleagues from Topigs Norsvin. The fair was the ideal opportunity to celebrate 1 year since the announcement of the genetic partnership agreement with Topigs Norsvin, and to launch the new JSR 9T - the first new F1 parent sow developed from the partnership. ncorporating the Large White (Z) line from Topigs Norsvin, this new sow will enable UK producers to rear more cost-effective finishers over the sow's lifetime. The JSR 9T incorporates new technologies such as genomic selection, as well as emphasis on novel selection traits and a greater emphasis on the contribution to the slaughter pig. Whilst many sows give large litters, this parent sows rears more progeny with a lower cost of production.